The ‘Ode of Intimations of Immortality’ was published by Wordsworth between 1802 and 1805, when transiting Neptune in Scorpio was crossing his Natal Ascendant (exact just around the poet’s 1802 thirty-second birthday). Neptune was also applying then to a sextile to Natal Moon in Virgo. Amazingly his Secondary Progressed Moon happened to be conjunct the transiting Neptune in Scorpio around the same date as well! The Progressed Mercury in Taurus and Progressed/Natal Saturn in Cancer were also in sextile with each other (Natal Mercury in Pisces was conjunct Natal Chiron and both were in trine to Natal Saturn in Cancer, good start). In his Solar Return for 1802 transiting Neptune happened to be on the Mid-Heaven and Mercury was returning to the place it occupied at birth). Between 1804 and 1805 (year the complete poem was published) transiting Neptune in Scorpio was trine Natal Mercury and Chiron in Pisces and Natal Saturn in Cancer (Water Grand Trine), around the time of Wordsworth’s thirty-fourth birthday. I came across some verses of this well known poem while reading a book on the Grail Quest by Trevor Ravenscroft. 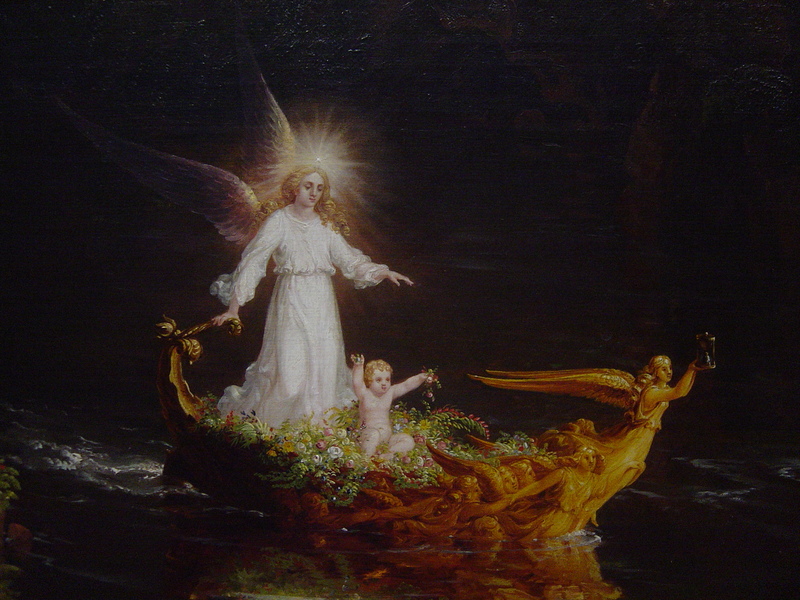 I felt that both the Holy Grail and the poem were great symbols for Neptune in Pisces. It is no coincidence that I am re-reading stuff about the Grail as Neptune trines my Sun in Cancer. 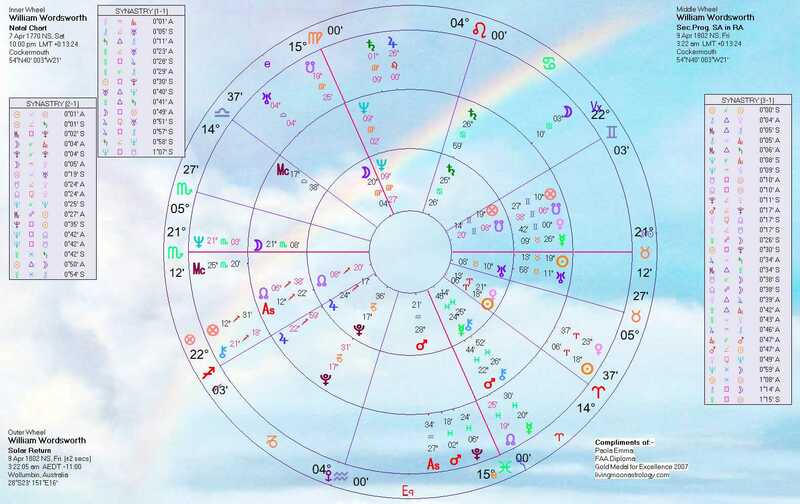 It got even better however when later I discovered the stunning astrological connection of poem and poet to Neptune, while I was posting the poem and decided to look at the poet’s Natal Chart and then his Progressions and Returns. So I have to share this. 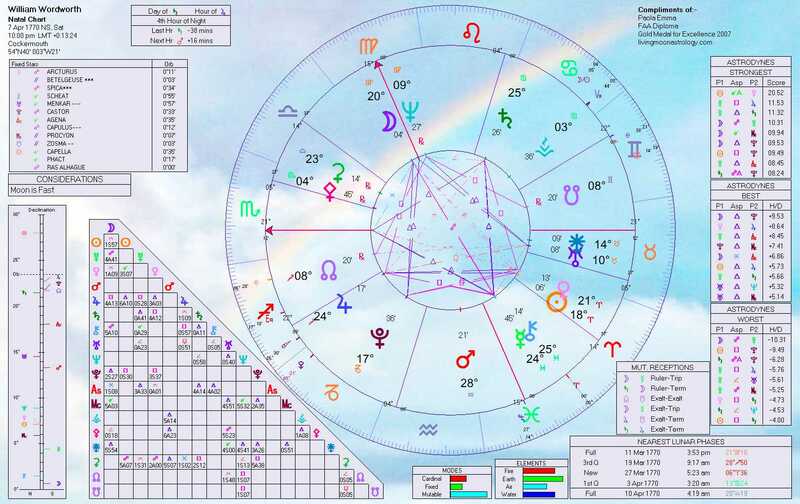 Here is William Wordsworth’s Natal Chart. And below it a 3wheels Chart with his Natal Chart in the inner wheel, his 1802 Progressed Horoscope in the middle wheel, and the Solar Return for the same year in the outer wheel. note: I have highlighted (bold) the passage of the poem I found in the Grail book. HERE is the Wikipedia article on this poem.